Business strategy and advice from the team at Straight Talk Group… you’re in the right place to get things Straight. The “Ripple Effect” is one of the most powerful forces in business. And it can affect you both in a positive manner, as well as negatively. In our last example, we discussed how valuable each of your customers can be to you over time. We called it the Lifetime Profit Value of your customers. Now, let’s take a look at what the cost could be to you if you lost a customer, instead of gained one. Let’s suppose for a minute, that you or one of your employees got upset with a customer, and they stopped doing business with you. No big deal, right? I mean, they were just one customer. And it’s not too difficult to get another one to replace them. And, how much would you lose if they never returned? In our previous example, $2,000. But now, let’s take a closer look at how the Ripple Effect could impact that one bad experience between you and your customer. If that unhappy customer were to tell 12 other people about that experience (or not refer those 12 people to your business), and each of those 12 were to tell six others, the total number of people affected by your one bad experience would total 85. (6 x 12 = 72 + 12 = 84 + the original unhappy customer = 85). Now, if only 25 percent of those people chose not to do business with you, that comes to 21 people. $42,000… all from one bad experience! But what if those figures are way off, and it’s only 10 percent of that amount? That still totals $4,200. They just get their feelings hurt, feel slighted, or have something completely unexplained happen, and take their business somewhere else. And you never know. However, mostly its because of perceived indifference. Well, you can’t afford to do anything but treat each of your customers the very best way possible. Give them all the love, care, attention and service you can. Kill them with service. Go overboard. Make it nearly impossible for them to even consider doing business with anyone else but you, regardless of price, location, convenience, or any other reason. Become not only the preferred place to do business with, but the only consideration your customers, clients and prospects have. Categories: Advice, Business, Coaching, Marketing, Reputation Management | Tags: business advice, business coaching, marketing strategy, small business, small business marketing, small business strategy | Permalink. There’s no question about it. Your existing customers are your most valuable assets. Since they’ve already purchased from you previously, and have experienced the benefits of your products and/or services (and presumably are pleased with those experiences), they are likely to purchase from you again, and if given the opportunity, are likely to refer you to others who may have a need for what you sell. Yet, nearly every business allots more money, time and effort to the acquisition of new customers than they do to keep their existing customers. If you’ll take a few minutes to work through the numbers, in very short time, you’ll find yourself light years ahead of your competitors. That’s right, this one simple exercise can immediately place you ahead of 95 percent of other businesses who compete against you. The Lifetime Profit Value of a customer is simply, the total profit produced by an average customer over his or her lifetime of doing business with you. For the sake of example, let’s suppose that the first time someone buys from you, you realize a profit of $100 on the sale. And, let’s say that they buy from you three more times during the course of the year, and each time they buy, you realise another $100 profit. That’s $400 in total profits for the first year. Now, let’s say that your average customer continues to do business with you for 5 years before their needs change, they move, or switch to another provider. For instance, if you know your average customer is worth $2,000 over the course of their association with you, you know how much you can afford to spend to keep that customer happy and coming back for more, and you’ll also know how much you can afford to spend to acquire a new customer. For example, let’s say your competitors are using a direct mail approach to contact their prospects. And if they’re like most people who use direct mail, they only send one introductory letter with one or two follow-up letters. Not that you have to spend that much, but look at the leverage and advantage you have over your competitors, just knowing what your numbers are. The only limiting factor should be your cash flow. And, as you increase your customer base and your profits, increase your budget as well. Figuring out exactly what your average customer is worth to you (their sales plus the profits on any referrals they give), can be one of the most important things you can do. Following the Restaurant Example we have two additional tables that you can use to determine the LPV of your own customers or clients. Email us and request them – Don’t pass these tables up – seriously – they are Super Valuable! One condition though – make sure you take the time to complete them. Categories: Advice, Business, Coaching, Marketing | Tags: business advice, business coaching, marketing strategy, small business marketing, small business strategy | Permalink. Marketing or the promotion of your business can be a costly endeavor. For some businesses, the money it takes just to get prospects in the door or to get them to respond to your ads, is often as much or more than is made in total profits on the sale. Some businesses look at spending money on marketing as a negative, or a “wash,” so they don’t aggressively engage in it. But marketing doesn’t have to be a business cost. It can really be an investment… an investment that returns a significant amount of profits to you, if you understand and approach it properly. It’s true that in most cases, it’s easier and it costs less to sell additional products and services to your existing clients than it does to new prospects. Some studies show that it costs five to six times more to sell to a new customer versus an existing one. In many instances, businesses actually lose money on each new customer they attract, because the costs of marketing exceed the profits they make on the first sale. If that’s the case, then it only makes sense to systematise your client acquisition activities, and sell more to your existing clients. 2. Get customers to buy more. 3. Get customers to buy more often. For now let’s limit our discussion to item number two… how to get customers to buy more. We’ve already established that this is the most cost-effective way to do business. So, if you want your business to grow… really grow… and do it in the least painful way, and with maximum results and minimum costs, you need to establish a systematic way to get people to upgrade their purchases and/or to buy additional products. People go through a variety of emotions prior to, during and after a purchase. Especially, a large purchase. In the time leading up to a purchase they go through a phase of excitement and anticipation about what your product or service will do for them. Sometimes there may be periods of skepticism or doubt, but if the person really wants what you’re offering, those feelings will be pushed aside, and excitement and anticipation will take over. After a sale is made, it’s not uncommon for a person to go through what’s known as “buyer’s remorse”… a feeling of uncertainty… not knowing for sure that they made the best or wisest decision. In time, those feelings can be overcome as they become more comfortable with the benefits of using your product or service. But, at the time of the sale, your prospect or customer is probably the happiest and most pleased with you and your relationship than at any other time. In fact, they are so happy that they have said, “yes” to your offer, and have even reached into their pockets or purses, opened their wallets or checkbooks and given you some of their hard-earned money. Sometimes, depending on the size of the purchase, a lot of their money. You’ve just solved a problem for them. So, this is the ideal time… when they are most pleased with you and when you’ve come to their rescue… for you to recommend other options or additional purchases. At this particular time more than at any other time, your customer is most likely to be receptive, open and willing to any suggestions you may make. So take advantage of the situation and timing, and recommend other options that would be in his or her best interest. “Bundling,” “Packaging,” “Cross-selling” and “Up-selling” are just a few examples of how you might provide additional products or services to your customers at the time of purchase. Any upgrades or additional sales you make in this manner are pure profit, since no advertising costs or other overhead expenses were incurred to create the sale. By incorporating this one simple step into your sales process, you can increase your sales amount per customer significantly, and really boost your bottom line. Now, suppose you don’t have anything else you can offer your customers. You only have one product or service to sell. Look around at complimentary, but non-competing businesses and see what products or services they might provide that you could offer to your customers. You want products or services that would be logical compliments to what you offer. …then you have a moral obligation to see that they get the very best use of that product or service. And that may mean that you make other products that will help them maximise the use of your product available to them… even if you don’t sell them yourself. Categories: Advice, Business, Coaching, Marketing | Tags: business advice, business coaching, marketing strategy, small business | Permalink. Getting referrals from the users of your products and/or services is one of the quickest, most effective and painless ways to build your business. Yet, most businesses fail to take advantage of this important marketing and business-building tool. In fact, not only do they not have a referral getting system in place, it’s surprising how many don’t even realise how powerful such a system can be. Referrals are simply happy or satisfied customers telling others about their positive experience with you, or them giving you permission to contact another person in their name. Every business should have a “system” in place for getting referrals. For some business owners or salespeople, asking another person for the name of a friend, relative or other business associate to contact so they can offer their services is very uncomfortable. 1. Earn the right to referrals by providing exceptional service. 2. Ask for referrals from your satisfied customers. 3. Reward (or thank in some way) those who give you referrals. One of the best ways to get referrals is to offer great service… to make your customer or client feel as though he or she is the only customer you have. But offering “good” service… even “exceptional” service may not be enough. People are used to getting a certain level of service from the businesses they deal with on a daily basis. Some of that service is good, and other service they receive is lacking. If you want to stand out, you must go beyond… way beyond the normal service they expect from, not only similar businesses to yours, but from any other business they’ve ever dealt with. You must ‘WOW’ your customer. You’ve got to go way beyond anything you, or anyone else in your industry or profession has ever done before. When your customer is so completely blown away with your service and attention, they’ll want to do business with you again, and they’ll feel almost obligated to tell others about their experience with you. Once you can see that you’ve not only met their expectations, but you’ve exceeded them and they are happy with the service or performance you’ve given them, you are in a position to go to the next step. There are a number of ways to do this. One way is to simply ask them who might be candidates for your services. Now, I know you might feel this step can cause tension in a newly created, positive experience, and undermine the relationship, but if you have a systematic method of asking, and your customer is excited with what you’ve done for them, it can be as natural as getting up in the morning. Once you receive a referral, make sure to express your thanks by giving some type of reward to the referrer. A simple thank-you is often enough. But many businesses or salespeople take advantage of small gift items such as movie tickets or gift certificates for dinner or a department store. Discounts or free merchandise or services from your own business sometimes can be a good choice. Whatever the reward, it doesn’t have to be grand or costly but it must be sincere and timely, and show that you really appreciate the confidence your customer or client has shown in you, and their gift of a name of a person you can contact. Once you’ve earned the right to ask for referrals from your customers or clients, then have asked them and followed up with a reward for their help, you’re in a perfect position to ask for more help from them. Whatever you do, don’t think that just because you asked and received one or two names, that it’s over. If you treat your customers right, knock them out with great service, then reward them for their help, they’ll be more than anxious to refer more of their friends, neighbors or acquaintances. After all, if were in your client’s shoes, and you’ve gotten great service from someone you’ve done business with, you’d like people you know to receive the same service, wouldn’t you? Especially, if you’ve been thanked or in some way shown that your help was appreciated. Competition is fierce in the marketplace today, and there is often little difference between competing products, services and prices. Getting referrals from your clients can no longer be considered a luxury or a “nice thing to do.” If you’re going to enjoy maximum success from your business with a minimum amount of time and effort, getting referrals is simply a “must-do” activity. And the best way to do that is by having a well-defined pro-active, referral-generating system in place. This can make this important marketing tool not only effective, productive and painless… but fun! Categories: Advice, Business, Marketing | Tags: business advice, business owners, marketing strategy, small business, small business strategy | Permalink. Testimonials are one of the most powerful tools any business owner can use, but also one of the most under-utilised. Testimonials are not limited to any one type of advertising or promotional media. Television ads, radio announcements, newspaper layouts and infomercials all make use of testimonials in one form or another. Sometimes, celebrities are used to promote certain products, especially when national or large scale exposure is involved. That is generally referred to as an “endorsement” rather than a testimonial, but the principle is pretty much the same. It happens when another person makes a positive statement or recommendation about a certain product or service. That is, if other people who are like me say this product or service is good, it improves the probability that it will be good for me, too. Also known as social proof. Celebrity endorsements are simply another form of testimonial and are very effective. If a certain well-known actor or celebrity says something is good, then it must be good. Therefore, I should give it a try. Most people know that in such commercials or endorsements, the actor is reading a prepared script written by professional copywriters, and are getting paid to read it. But they still attach a certain amount of credibility to what the actor says, in sufficient numbers to not only pay for the actors’ salaries, but to make substantial profits, as well. Your own clients are some of the best sources of endorsement you could possibly want. Especially if they are known to those you are marketing to or if they have something else in common with them. Perhaps they live in the same town, have similar businesses, or belong to the same organisation or association, etc. At any rate, when people hear that other people, much like them, who have similar interests, needs, wants, or desires have benefited from a certain product or service, the chances of them wanting to know more are dramatically increased. They have no use for your product or service. They can’t afford your product or service. You haven’t developed the level of trust and believability they need in you to do business with you. There’s not much you can do if a prospect can’t use or pay for your services. But there is a lot you can do to help wipe away the underlying layers of skepticism they bring to the relationship and establish the trust level they need to say “Okay” to your offer. And, well ineffective marketing, that’s another conversation altogether. People don’t like to be the first to do anything… especially if it involves parting with their hard-earned money. Testimonials are not difficult to get. One of the most effective ways is to send users of your products or services a questionnaire that asks for their feedback on how they’ve benefited from using it. The questions should be in “open-ended” form, and ask for them to write their feelings… not just for yes or no answers. Another effective method is to call your clients on the telephone and record the conversation (with their permission, of course). Then you can transcribe the parts you want to use, and send a copy to them for their approval and authorisation. Often, after a brief warm up, people will forget the tape is running, open up and give you all kinds of good, useable information. Using testimonials… specific testimonials, is one of the most effective ways you can eliminate fear, increase the believability and credibility of your offer, and add to the number of sales or inquiries to your advertisements or promotions. Categories: Advice, Business, Coaching, Marketing, Publicity | Tags: business advice, business coaching, marketing strategy, small business, small business marketing | Permalink. That is, you peruse or scan through the paper reading only the headlines, and if one happens to catch your interest, you may read the accompanying article. The sole purpose of a headline is to catch the reader’s interest and create a desire for them to read further. That is why headlines are printed in large, bold type. 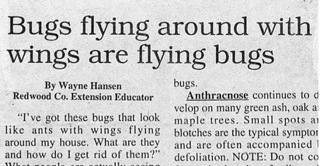 Good headlines are designed to reach out and grab the reader by the eyeballs and say, in effect, “Hey, stop turning the pages and look what I’ve got to say to you!” The best place to see good headlines is in the newspaper. The absolute worst place is in the Yellow Pages of your telephone book. “Automobile Insurance” – Really? I’m in the insurance section of the book. I would hope you sold auto insurance. “Better Things To Do Than Shop For Insurance?” – Answer? Of course I do. And I have better things to do than answer your dumb questions, or to read your insulting ad any further. “Instant Computer Quotes” – So what? Any one of a number of the other companies listed can do the same thing. Why should I call you or read any further? None of these headlines get me excited enough to read any further. So guess what? I won’t! And, if I won’t… a lot of other people won’t, either. These kinds of headlines are written to get your attention… to interrupt you… to get you to stop and read further. Notice that there’s no mention of anyone’s name and no insulting or silly questions… just interest-generating copy designed to do a job. One job. To get your attention. And they do it very effectively. People use headlines to help them decide what they’re going to read. So help them out. Now, let’s create an example. Suppose you own a computer store and want to run an ad to sell your computers. Which of the next two headlines would pull the largest readership? There’s no question. The second ad would win hands down. It says something to the reader. It captures their attention. It addresses a situation that they can relate to. It tells them boldly, that they can stay home, not fight the traffic, not buy expensive work clothes, not pay for dry cleaning, save on car expenses, and make good money… and they don’t even have to know how to use a computer. It even suggests that you don’t even have to presently own a computer, but if you were to buy one, you could earn this type of money. But, as a computer store owner, how would you fulfill that promise? Actually, that’s a subject in itself that we could go into great depth on, but here’s a brief answer: For one thing, you could offer a free training manual or video to everyone who buys a computer as a result of this ad. But that’s not the point here. What’s important is which ad was most effective? Take a trip back to the Yellow Pages and see how many ads have headlines like the first one above. (No wonder so many businesses are in trouble today.) Your headlines should offer your prospects and customers the biggest benefit your product or service can provide. If you can’t get their interest with the biggest benefit you offer, you’ll not get them with anything less. Headlines don’t only have to be limited to print ads, either. You can effectively use headlines in your sales letters, your telemarketing efforts and your personal greetings when a customer is in your place of business. It’s the way you phrase your opening statement that determines whether or not they have an interest in what you offer. Have you ever heard that before? Have you ever used it? Of course you have. And you know the exact response, right? “No, I’m just looking.” Not a very effective way of getting a prospect’s attention, is it? No wonder (again) why so many businesses are having trouble. Why not take the time to construct an effective opening headline, not only for your printed materials, but for your verbal presentations as well. Some advertising experts estimate that five to six times as many people read the headlines as do the body copy in an ad. That may be true, but if the readers are busy people… people on the go, those figures are most likely on the very low side. The right headline can make or break an ad. If the headline doesn’t get the reader’s attention (and do it in just a couple of seconds), and instill in him a desire to read the rest of the ad or promotion, the headline has not done its job. It’s failed. Headlines are so important to the success of an ad that you should spend whatever time it takes to create attention-getting and interest-building headlines that appeal to the reader or viewer’s emotions. It’s not uncommon for professional copywriters to write over 100 headlines in order to come up with one or two good ones. And testing is one way (probably the best way) to determine which headlines work the best. Sometimes, changing just one word in a headline can improve its pulling power by several hundred-fold. If you need examples, some of the best and most effective headlines can be found in tabloid publications like The National Enquirer, The Globe and The Sun, or on magazines like Cosmopolitan or Reader’s Digest. In many cases, just a four or five word headline describes what’s in the entire article. And, it’s the headlines that spark an interest and make you want to buy the publication and get into the articles to find out more. That’s what effective headlines are supposed to do. Other great headline examples are the article titles on the fronts of magazines. This “teaser” copy is what makes people pick up magazines while waiting in check-out lines, and is responsible in large part for what sells magazines. If you’ve ever wondered how important these titles or headlines are, just compare the covers of a Reader’s Digest that comes to your home by subscription with the same issue that’s sold on the newsstand. The home delivered issue is already sold, so the headlines are more subdued, not so bold, and often refer to completely different stories or articles inside. On the other hand, the newsstand version is competing with every other magazine on the rack, including the tabloids with their often outlandish and boisterous headlines. Whatever you do, don’t let any of your advertising pieces go out without an attention-grabbing headline. An effective headline can make all the difference in the world to the success of your marketing efforts. We have identified 20 Marketing Mistakes That Can Be Fatal To Your Business And How To Keep Them From Crippling You. This is just one, If you would like the rest email us at results@straigttalk.com.au to with “20 Mistakes” in the subject line and we will have them sent out to you. Categories: Advice | Tags: business, coach, headlines, marketing, results, success | Permalink. Who should you market to? If so, was that planned? If they’re not the same, why aren’t they? These questions are critical to the success of any marketing program. You can have the very best product or service on the planet. You can have the most attractive offer, the lowest prices, lots of bonuses, personal attention, and the best service available. But if you offer this wonderful package to the wrong market, you’re sure to fail. On the other hand, what if your package… your total offer, isn’t that good? Let’s say it’s just average. Let’s also assume that your prices are not the lowest, but they’re at least in the ballpark. You’ve really got nothing special that the rest of your competition can’t offer. But you have a great list to market to. Well-qualified, highly motivated prospects with the authority and the ability (money) to buy. With that kind of market you just about can’t lose. Targeting your marketing efforts to the right people can make or break your entire advertising or marketing campaign. And if you’re a small business, you can’t afford to have that happen too many times. It’ll drive you right out of business! One of the best ways to make sure you’re marketing to the right group is to go back over your records and create a list of your current and past customers and clients. You know the people in this group are the right people to market to, because they’ve purchased from you before. Everyone who inquires about your products or services, or who makes a purchase from you should go on a list. You should capture, at the very least, their name, address, phone number, date of purchase, what they bought, and how much they spent. If you’re using the internet, you should also try to capture their email address. [Example] Radio Shack is one of the best at doing this. Even if you just buy a 79-cent battery, the clerk gets or updates your mailing information. The next thing you know, you’re getting all kinds of mailers, promotions and ads in the mail. It’s been a very important and successful part of their marketing program for years. If you do the same thing… get contact information from all your customers, the next time you want to make a special offer or run a certain promotion, you’ll have a very targeted list of people who have used your products or services in the past, or who have at least inquired about them. And remember, all things being equal, people would rather do business with people (or businesses) they know, they like, and they trust. Another thing you can do is send a Customer Questionnaire to all your existing customers asking for information that can help you determine who buys, what they buy, and why they buy from you. By analysing the characteristics of the people on this list, you can then develop a demographic model of other people who would be likely candidates for the kinds of things you offer. Since you’re not marketing to the general public, very specific offers can be made to these target markets. Not only will your hard marketing costs be considerably less, your response rates will be significantly higher. You can spend a lot of needless time and money marketing to the wrong market. If, for instance, you advertise that you have the lowest prices, you’ll undoubtedly attract people who are price shoppers. That’s not altogether bad, but if you’re looking for long-time relationships with your customers, low price shoppers may not be the best market for you to attract. As soon as a competitor advertises a lower price, or gives a little more away for the same price you’re charging, your customer is likely to bid you adios. Long-term relationships presuppose loyalty. Loyalty from both the customer, and loyalty from the business. If, as a business, you provide exceptional and continuing value to your customers, they, in turn, will continue to buy from you as long as the need exists. By identifying the kinds of customers you wish to acquire, and then targeting those kinds of prospects, your customer acquisition costs will be reduced, and your customer retention percentages will soar.